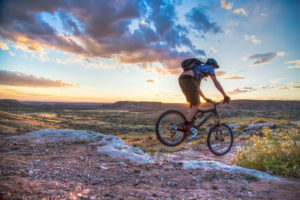 Spring is a great time to escape the higher altitudes of the Rockies and head to Vernal, Utah, for some of the region’s best and least-crowded mountain biking and camping. So far, Lupcho is right. Vernal’s economy is rooted in the gas and oil industry, preserved in a rural lifestyle that makes outdoor adventure seem like an afterthought. “You kind of take a step back in time here,” said Lupcho. A healthy influx of blue-collar businessmen, employed in the energy industry, drive up mid-week rates, and most of Main Street goes dark on Sunday. But recreational visitors don’t come here to indulge in modern amenities. “If you’re self-contained, you can’t find a better place to camp and ride,” said Lupcho. Still, it’s hard to talk about Vernal without comparing it to the vast, high desert turf of nearby Fruita, an observation that’s not lost on Lupcho. “It’s a lot like 18 Road,” he said, referring to its most popular trail system. “We’ve got that wide, open, undulating singletrack that you can see for miles.” And whatever your level of skill, there’s a unique blend of trails for everyone. 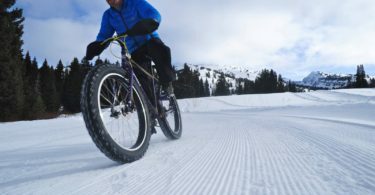 With nearly a 10-month bike season, spanning from March through December, Vernal dries out well before a typical Wasatch, Teton or Rocky Mountain winter comes to an end. This year, Lupcho says he had been riding dirt all winter—until the recent mid-February storm finally deposited snow. So it’s a fat bikes for now, but Lupcho figures the snow will be gone by the end of February. 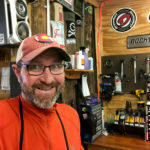 While summer and fall are great, Lupcho says March through June is prime time to explore the 100-plus miles of trail in four distinct trail networks of Vernal. March is when Vernal begins seeing anxious riders, from around the Rockies, who have grown tired of the snow and are itching to see dirt. If you like mountain bike festivals, Lupcho says Memorial Day weekend is a great time to come. This is when the Northeastern Utah Mountain Bikers (NUMB) holds its annual two-day (Saturday & Sunday) NUMB Fest mountain bike festival. Group rides, parties, demos and camaraderie are what the festival is all about. Explore Vernal’s most popular trails and you’ll find yourself in McCoy Flats, the epi-center of the Vernal mtb scene. McCoy Flats is an open BLM range just off U.S. Highway 40. It’s the site of Vernal’s first established bike trail, Squat Drop, and an area that’s shared among target shooters, equestrians, and RVers. 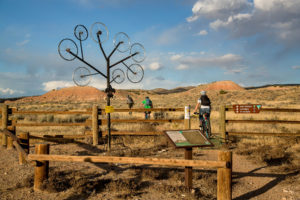 But with 12 non-motorized trails, cyclists can loop together more than 60 miles of fast desert dirt that squiggle and snake their way through swollen hills. As McCoy Flats is public domain, camping is free and plentiful, giving you the freedom to establish basecamp out in the boonies or along any trail’s edge. If you are looking for the quintessential Vernal trail, Lupcho says Serpendipity or Retail Sale are must-rides. Link to other trails, like Got Milk and And Cookies, to create any length of ride. Located just past the Red Fleet State Park, the Red Fleet trail network is surrounded by sandstone amphitheaters buffed smooth by prehistoric glacier melt and ridgelines dense with stringy junipers and sagebrush. Rock piles and limited sight distances add technical thrills to the small handful of well-worn trails, including a half-mile stretch of manmade features for advanced freeride flavor. With the support of bike-happy BLM land managers, expect the quantity of new trails to increase over the next few years. Technically, there are only two trails in the Lapoint network recognized by land officials, but like Red Fleet, the area is ripe with fat tire potential. With forgiving soil and serpentine turns—like those found on the aptly named Corkscrew trail—the modest singletrack in Lapoint is optimal for beginner cruisers, yet it begs skilled riders to whip through fast straightaways and snappy corners. 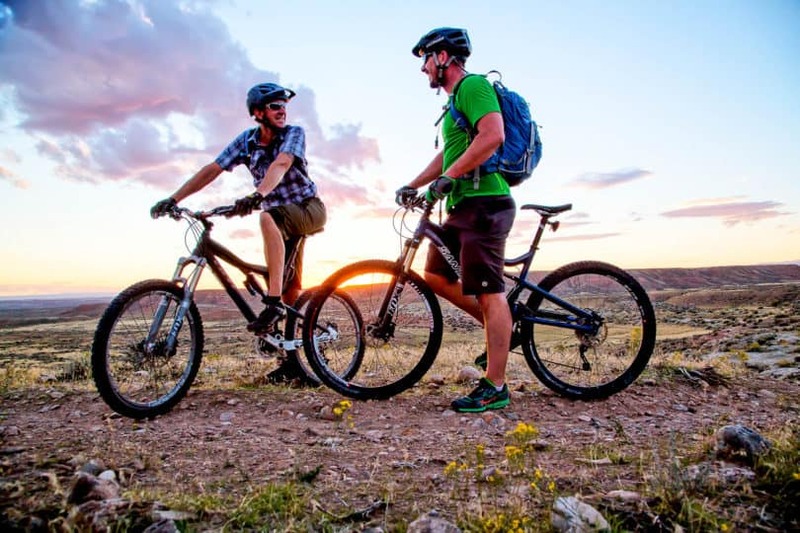 While Flaming Gorge often snags the attention of fishermen and boaters, the 43-mile drive from Vernal rewards fat tire pursuits with a combination of roly-poly doubletrack and panoramic singletrack. Several trails wiggle along the Flaming Gorge plateau, with technical obstacles appearing in the form of loose rock and equestrian traffic. A low-consequence rim trail hugs the south side of Red Canyon for a scenic out-and-back tour that’s arguably better on bike than boat. Like most places in the West, visitors travel to Vernal primarily by automobile. So load up the car and, for the ultimate Vernal MTB experience, plan on camping near McCoy Flats. The bulk of the dispersed camping is on the east side of McCoy Flat Road, before and after the trailhead. Some people have been known to camp right at the recently developed parking area which includes picnic tables. But like we mentioned above, you can virtually camp wherever you desire. If you are coming from Colorado or Wyoming, you’ll have the opportunity to stock up on supplies as you pass through Vernal. If you are coming from Utah, you might want to make sure you bring everything you’ll need for at least the first day. Vernal is only 10 miles from McCoy Flats, so resupply and civilization are close at hand if you need it. 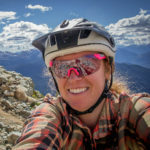 While there’s nothing like a cold beer immediately after your ride, and good camp grub soon thereafter, eventually you might want to spend a night or afternoon on the town. Lupcho tells us that the best place to find a good beer and gastro pub grub is either the Vernal Brewing Company or the Dinosaur Brew Huas. After riding, eating, drinking and sleeping, you might have a couple hours to spare. From exploring Dinosaur National Monument or the Ouray National Wildlife Refuge on the nearby Green River, there are plenty of options. Check out Visit Utah for more ideas.